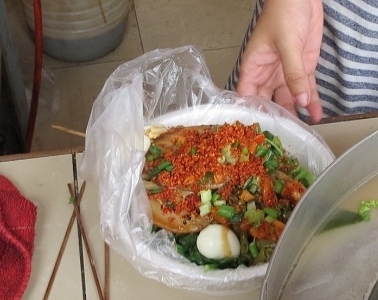 For less than a dollar, on the streets of Guangzhou, China, you can get a balanced meal in a bowl of noodle soup. Select your own fresh greens, choose from a variety of meats, shrimp or tofu, and your assembled ingredients will be cooked to perfection in a divided pot of flavorful broth. Try this at home by preparing a large pot of broth and invited family or friends to select from the fresh ingredients you prepare. Offer a choice of noodles: some thin, some thick, some made from rice, some made from wheat. The broth can be prepared a day or two ahead of time, as long as you have space to store it in the refrigerator. Depending on your preference, you can roast the soup bones for an hour in a 400 degree oven, or you can put the raw bones straight into a big pot of cold water and boil them. If you are using the optional flank steak, you can also pre-roast it with the bones before making the broth. If you don't roast the bones, allow them to boil for about 10 minutes to surface the excess fats. While the bones are boiling, place your cloves, peppercorns and star anise in a cheesecloth bag or a submersible tea infuser. Skim off the fat and then add all of the herbs and spices to your broth, or start your roasted bones to simmer with all of the herbs and spices. Allow broth to simmer for 3 - 4 hours, occasionally skimming off excess fat. When the broth becomes golden brown and flavorful, discard the bay leaf, cinnamon stick, nutmeg and the container of cloves and peppercorns. Add salt at this point, if needed. Place all the spices in a heat-proof bowl. Heat oil until a wisp of smoke appears. Carefully pour the hot oil over the spices. After five minutes, remove the bay leaf and the star anise. While your broth is cooking, clean and trim your selection of vegetables, noodles, meats or shrimp. Arrange the ingredients in separate bowls or on a platter. If using bean curd skin, soak it in cold water for at least 30 minutes. Fill a pot with salted water and start it boiling for cooking the noodles. Cooking the noodles separately prevents the starchy noodles from clouding your broth. For a make-your-own noodle soup party, you can par-boil the noodles in advance and then each person can dip a mesh basket of his choice of noodles into the boiling water to reheat for 45 seconds before serving. If you're giving people a choice of noodles and other ingredients to make their own noodle soup, it is good to have some mesh or silicone pasta baskets to cook different noodles at the same time and also to keep the greens and meats separate as they cook in the broth. Put meats or shrimp or tofu along with daikon radish slices into one basket and submerse it into the simmering broth. Put fresh greens into a second basket to submerse for just a minute or two. Put the hot noodles on the bottom of a bowl, arrange meat or tofu and vegetables on top of noodles. Ladle hot broth to cover the noodles and garnish with chili oil sauce, green onions and cilantro to taste.